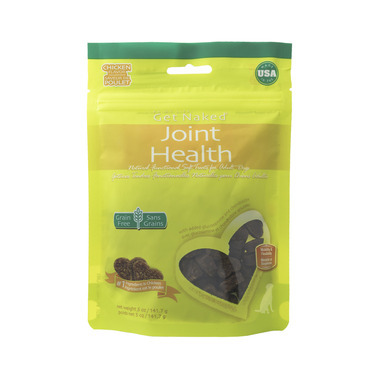 Get Naked® Joint Health soft treats for adult dogs are formulated with glucosamine and chondroitin to help improve mobility and flexibility. Chicken is the number one ingredient and these delicious treats are grain free. Get Naked® Joint Health soft treats can be used in conjunction with other Get Naked treats for good overall health and well-being. Their small size makes them ideal for rewards during training sessions, as well as a regular anytime treat. With added Glucosamine HCI and Chondroitin Sulfate.